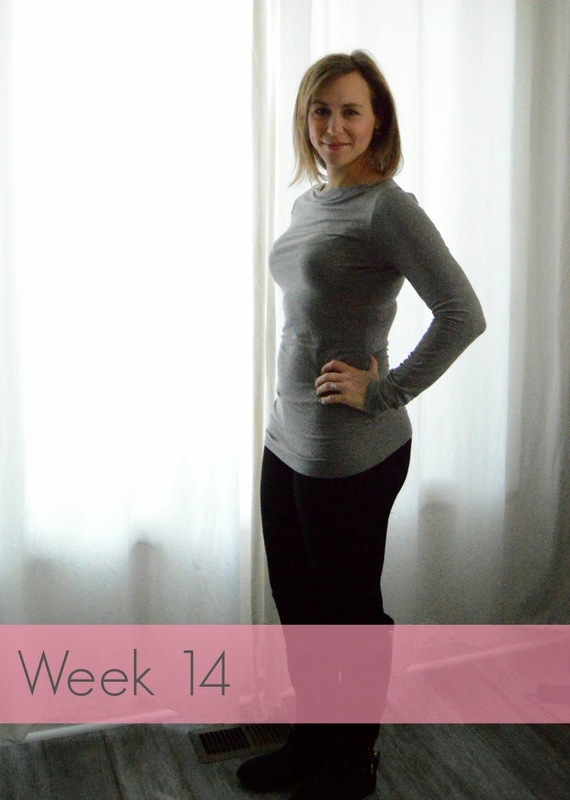 Total Weight Gain| I'm just going to say about the same, really I have no desire to step on a scale, though I know I need to to keep things in check. I'm kind of scared to because I definitely feel bigger! Gender| ??? We're not supposed to find out until our anatomy scan at 20 weeks, but I'm kinda hoping since I have an ultrasound at my 16 week appointment that maybe, just maybe we can find out then. Symptoms| At the beginning part of this week, it was almost like I didn't even feel pregnant, almost. I'm feeling less tired, and less hungry all the time, though when I get really overly tired watch out, it's not pretty! I'm getting anxious about when my belly is going to pop and stop just looking like I gained 10 lbs. Cravings| I'm still on the cheese, part of the reason why I wanted to badly to go to the Melting Pot last weekend, at least I'm getting my calcium, right?! Sleep| I've had 3 nights in a row of uninterrupted sleep, no bathroom breaks, it's been great. I'll take it. Clothes| I most definitely need to invest in some more pants, I'm just procrastinating, or I'm just picky, however you want to look at it. I need to find a good pair of comfy leggings too. Unless I'm wearing sweatpants, or the pair of maternity pants I have, or have my pants unbuttoned I'm pretty uncomfortable. Workouts| I'm holding pretty steady at 3 sessions a week. I keep saying I want to boost it up, and I really do, I'm just severely lacking in the motivation department. I actually miss running, which I have this love hate relationship with. I know you can still run while pregnant, but I decided not to because I have a really hard time keep my heart rate in a good range when I'm running. Though I'm desperately looking forward to warmer weather where I can at least go for walks outside. Nursery| I've started doing some online browsing, but priority number 1 is still getting the room cleaned out, which honestly hasn't even been started on yet. I told Martin we need to get on that ASAP! Movement| I think we're still a bit away from this one. Best Moment this Week| I can't say there was any one thing in specific that was the highlight of this last week, I am just super thankful that so far this pregnancy has been pretty easy and uneventful and I can only wish that the rest of it stays that way! You look absolutely beautiful! I'm glad everything is going so well for you for you so far - hopefully it stays that way! Fingers crossed that you get the anatomy scan early and that a little mommy-to-be present arrives for you soon! You look great...no baby bump in site! And you already have "the glow".....I'm so jealous. I'm just waiting for the day my breakouts are replaced with the glow...haha! I soooo hope you can find out the gender at your 16-week appointment...that seems to make it so much more real! You look great! And I was able to find out the gender at my 16 week appointment, so fingers crossed you can too! Thanks, I'll take it while I can! Thanks! That's my biggest fear, I don't want to invest in all these clothes now to not be able to use much of them later. Thank you SO much for your little package, so sweet! I so badly hope we get to find out soon, I'm anxious to get planning! Your sweet, it's funny because when I got dressed to take these photos (and you can ask my husband, he will testify) I told him I felt like a sausage stuffed into a too small casing, everything felt way too tight I thought I was going to explode! I just want to get to the point where I actually look pregnant and not just like oh she's gained weight! I swear the glow is 100% makeup! I've heard so many people who've found out at 16 weeks so I'm crossing my fingers that our ultrasound tech is feeling nice and generous that day! You look so cute, lady! Glad you are sleeping well!!! Buy a few cheaper pants for the beginning (My favorite work pants are from Gap Maternity) but don't go too crazy! There is a chance (if you are anything like me) that your legs will swell later in the pregnancy, which means you will probably grow out of the pants you buy now. You look adorable!